I ate the crap outta this cake for days. It was a recipe that kept morphing: I wanted something chocolaty, a cross between a brownie and a cake. I was craving blackcurrant in everything for some reason. And I was digging throwing multiple textures around. But then I decided to not go with chocolate. Chocolate, while I love it, has a lot of caffeine in it. And carob, its under-acclaimed cousin, contains no caffeine. It’s also high in fiber, has a decent amount of protein, and has one third the calories and half the fat of chocolate. And it’s incredibly high in antioxidants. It’s also naturally sweet, meaning you use less additional sweetener in baked goods! So in this I used 8 Tbsp of carob and 2 Tbsp of cocoa, to give the cake an incredible depth. Layers of blackcurrant jam and vegan blackcurrant “cream cheese” frosting packed an incredible punch. And a sprinkling of slivered raw almonds added the crunch I was craving. The gluten-free flour blend was pushed along by the addition of 2 tablespoons of Cabernet wine flour. It’s an uncommon one – sort of hard to find online. Made out of the skins of grapes, it’s a bit grainy and offers an aftertaste that can be a bit sour, which is why 2 tablespoons is the top I’d go in a delicate cake recipe. I then slathered it with my vegan Blackcurrant “Cream Cheese” Frosting. The result: an incredibly rich combination of currant and carob, dynamic and layered. I literally ate it for days. And kept piling the frosting on top of anything I could find to go with it. Preheat oven to 350°. Grease desired cake pan of choice. In a small bowl, whisk together flours, xanthan gum, baking powder, baking soda and spices. In a small saucepan over low heat, melt butter. Slowly add carob and cocoa and whisk until dissolved. Then slowly whisk in blackcurrant. Set aside to cool. In a standing mixer with the whisk attachment or with a hand mixer on medium/high speed beat eggs, and palm sugar until the sugar has completely dissolved and the mixture is very smooth and creamy. Reduce the mixer to low speed and slowly add the carob mixture until combined. Fold the flour mixture into the carob / egg mixture. Pour into the pan and bake for 25 minutes or until a toothpick inserted in the middle comes out clean. Cut the cake into squares or circles as you see fit, into three layers. Layer 2 Tbsp of blackcurrant jam between each layer. 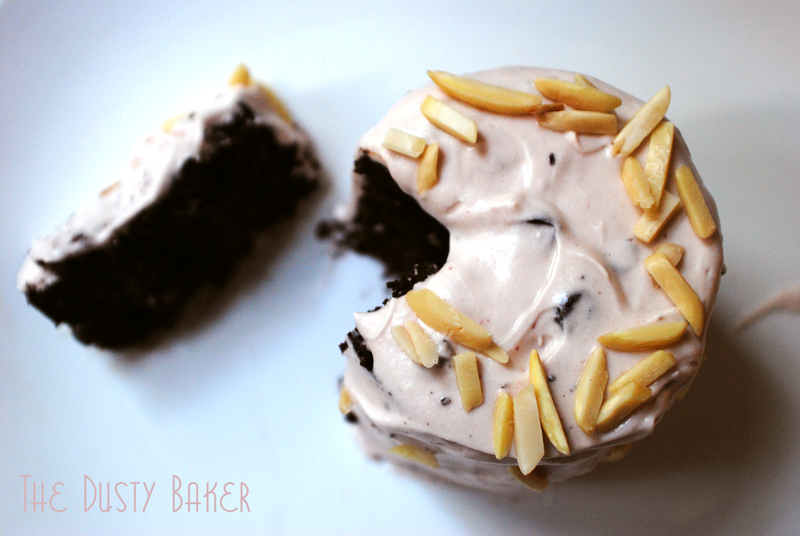 Cover with blackcurrant cream cheese frosting and sprinkle with almond slivers.